Ken McIntyre was the last recipient of the Albert Medal which was instituted in 1866 and discontinued in 1971. The medal was named in honour of Queen Victoria’s husband, Prince Albert, and awarded for the saving of life at sea. On 25 August 1969, the coastal freighter, Noongah, foundered in a storm off Nambucca Heads, NSW. The ship was taking a load of steel from Newcastle to Townsville. Of the 26 crew on board, only 5 survived. Among the lost crew members was Kenneth Owen McIntyre from Fairy Meadow, He was employed as a greaser in the engine room. Shortly before the foundering of the ship he was seen with other crew members on the poopdeck, wearing his lifejacket but was then seen to remove it and informed the other crew members present that he was returning to the engine room to see if he could render any assistance. It was not clearly established before the court of Marine Inquiry into the loss of the ship whether McIntyre later entered the water wearing the lifejacket. However, after the foundering three crewmen who were clinging to a plank saw McIntyre without a lifejacket supporting the Chief Cook to the comparative safety of the plank. McIntyre heard someone else calling for help and left the plank to attempt to render assistance. He didn’t return to the plank and was not seen again although his lifejacket was among the debris recovered from the sea. 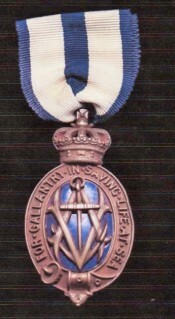 In addition to his Albert Medal, Ken McIntyre was posthumously awarded the Bronze Medal of the Royal Humane Society of NSW. Ken McIntyre was born on 7 October 1942 at the Strathmore Private Hospital in Wollongong, the son of Neville and Lillian McIntyre. He attended Coniston Public School and later Fairy Meadow Public School. Ken completed his education at Keira Boys’ High School. From March 1964 until his death, Ken served on a number of ships owned by BHP Limited carrying iron ore and other resources around the Australian coast. The family lived at 39 Bassett St, Fairy Meadow.